Jenny currently lives in Bellingham, WA, but grew up in Kirkland. She is a true Pacific Northwesterner, born and raised. She received her bachelor's degree in Environmental Education from Western Washington University and worked with us last year as our Season 2 Program Coordinator. Her passion is orcas! Ask her anything about orcas. She would love to chat about them anytime, anywhere. Kathryn will always call the Pacific Northwest home, but for the past few years she has been soaking up the sun in New Mexico. She recently earned her B.A. in Outdoor Recreation from Western Washington University, with an emphasis on the natural history of the Pacific Northwest. She joined us for a month-long internship in 2015, stayed on as a winter crew member, and is back on board as the half-season Galley Coordinator. Patrick has been bouncing around the state since last summer, but the Puget Sound area will always be his home. He has a B.A. in Environmental Education from Western Washington University. Patrick recently worked as an educator with the Inland Northwest Nature Connection in Spokane, and he is currently helping them grow their fledgling non-profit from afar. Fun Fact: he runs an ocean science blog called Depth and Taxa that works to share the wonders of the marine environment with people who might never see the ocean. Faran grew up in Colorado and now home is wherever her boots are. She has a bachelor's degree in Biology from Lawrence University. She spent the last two years as a farm manager, picking (and eating) blueberries at a farm in Massachusetts. She has a black belt in karate and kickboxing. Sam spent the first half of her life in Southern California. She earned her B.A. in sociology from Middlebury College and most recently a Yoga Teacher Training certificate from a yoga school in Rishikesh, India. Her last paid job was teaching English to high school kids in Basque Country, Spain. In the last two years, she's volunteered in 18 different countries and slept in 171 beds. Grace grew up in Baltimore, Maryland, and is currently pursuing her bachelor's degree in Marine Biology and Environmental Studies at Northeastern University. For the past two summers, she worked as a captain of 50' sailboats and as a marine science instructor at Sail Caribbean, a summer camp in the British Virgin Islands. An avid scuba diver, Grace spent many of her recent dives perfecting the ability to blow bubble rings underwater. Emily hails from Michigan and currently lives in Mystic, Connecticut. She recently graduated from the University of Connecticut with a master's degree in Oceanography. She worked at UConn as a Lab Technician, where she assisted students with trace and bulk element geochemistry in a paleoclimate lab. When she's not in the lab, she loves to bake and take long walks with her dog. Colin is from the town of Cambria, California, and has long pursued his passion for exploration. He discovered Adventuress while riding from Alaska on a bicycle he built himself. He spends all of his free time thinking of good band names. Jeremy hails from central Illinois, but can often be found in the Pacific Northwest, or scouring the earth for knowledge. He is neither protist nor fungus, vegetable nor mineral, but a person much like yourself. He studied Outdoor Leadership through WSCU. In the summer he leads sea kayaking trips for Camp Orkila on Orcas Island. He has been to 19 countries, written two novels, and recently learned to whistle. 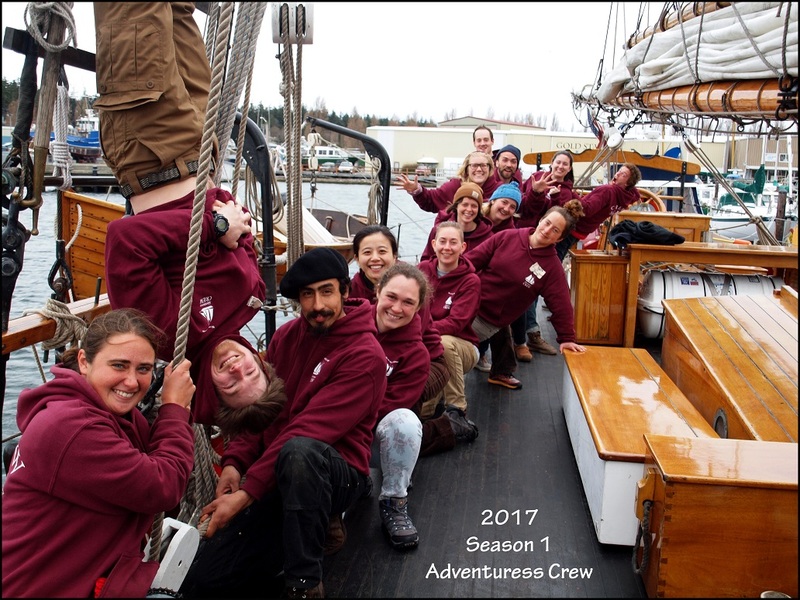 Kristin got her first taste of life on Adventuress as an Educator / Deckhand Intern last summer and loved it immediately. Originally from Bellingham, Washington, she currently spends most of the year in Bozeman, working on her double major in Geology and History as a student at Montana State University. During the school year, she continues to pursue her passion for outdoor education as a Trip Leader for the MSU's outdoor recreation program. In her spare time, she's learning classical guitar, classical Greek, and fencing. Greta lives on Bainbridge Island on a 25' sailboat. She holds a B.S. in Community Development from Penn State University and will begin her master's in Environmental Education at the University of Washington this fall. Greta is a farmer by trade, and she has worked on farms of all sizes across the country. Her favorite vegetable is the humble radish. She is excited to grow into a more confident sailor and educator aboard Adventuress as she continues working towards her dream of someday sailing around the world. Jing is from Chapel Hill, North Carolina. She has an M.S. in marine biology with minors in chemistry, environmental science, and policy from Duke University. She Last worked for CIMI Tall Ship Expeditions as the second mate and bosun on the Tole Mour, a three-masted tall ship that conducted educational programs in southern California. She is currently in medical school and 2 months from receiving her M.D. from UNC: Chapel Hill. She will be going into the field of anesthesia. Jing has been a season-long crew member on Adventuress in the past, and she is excited to be back aboard. Nate returns as Chief Mate. He grew up in Port Townsend. He received his 100 Ton Inland Master’s license in 2012. Most recently, he was working for the Center for Wooden Boats as a sailing instructor and assistant Boatwright. In his spare time, he likes to build bikes. Kathy returns as Program Coordinator. She has been a Middle School teacher for 15 years. Three years ago she left the classroom to explore, volunteer and discover new ways to connect. Kathy is passionate about experiential learning, travel, sailing, farming and being outdoors. She has a master’s in Middle Level Education from Central Michigan University and currently calls her little green van, and this beautiful ship, home. Arthur is returning this year as Engineer. He is from Brattleboro, VT. He holds a B.A. in Geology from Oberlin College. He has worked for the Rich Earth Institute in Vermont, a research institute working to develop urine as a fertilizer! When he is off the boat, he loves to weave cloth on his loom! This is Rebecca's third season cooking on the Schooner Adventuress. With a degree in Mandarin Chinese, a minor in music, and no sailing experience to speak of, Rebecca was particularly suited to the mariner's life when she joined the organization last year. She loves teamwork, obscure plant identification textbooks, and the Pacific Northwest. This is Julia's second season on board. She is from Knox County Maine or Kentucky- as she has lived in both places. She earned a degree at Tufts University in American studies and Community Health. Her most recent job has been at Knox Central High School, as a Science Teacher. Fun fact about Julia is that she got second place to Arthur the engineer by 2 seconds in the green horn challenge last year and is coming back to defend her honor. Sam is from Yorktown, New York, and has received a B.S. and M.S. in Earth and Atmospheric Sciences from Cornell University (depending on when you read this). He has previously been a student aboard the SSV Robert. C. Seamans with SEA Semester and a volunteer aboard the Hudson River Sloop Clearwater. Sam likes to perform improv and stand-up comedy, and he once met Steven Tyler on an airplane. Elena calls Western Washington my home, although she grew up in Puyallup, WA. She has a degree in Environmental Science from Western Washington University in Bellingham, WA. Her last job was Marine Scientist for Salish Sea Expeditions, where she worked as an educator helping facilitate inqury based science programs aboard the Carlyn. A fun fact about Elena is that if she was a tree she would be a ponderosa pine. Lena is an island girl from Bainbridge. She earned her undergraduate degree in Geology from Whitman College in 2016. She worked for Sea Education Association as a deckhand in New Zealand aboard one if their Tall Ships. She loves spending time outdoors, skiing, hiking, sailing, you name it. Quinn was born and raised in the far off land of Redmond Washington and has come to crew on the Adventuress in his summer off between high school and college. He has seen past employment as a drone photographer for his school and as a ski instructor. The last time he raced a sailboat, he was in Table Bay, South Africa. Grace hails from around Bellingham, Washington, and is a rising senior at Whitman College pursuing a double major in Anthropology and Art. When not sailing, she teaches children classical fencing, sculpts dragons to sell at Renaissance Faires around Washington, and illustrates for the web serial The Clockwork Raven. She also enjoys acting, drawing, and playing music with her fellow minstrels. Addie is from the Philadelphia suburbs and will be studying public health and international development at Tulane this fall. She was recently a teaching intern at Echo Hill Outdoor School on the Chesapeake Bay, where she taught youths about the environment and leadership. She's currently taking a gap year, during which she's lived on a horse farm in upstate New York, assisted a midwife in the Dominican Republic, and spent a month exploring France. Emma is from Saint Petersburg, Florida, where she is studying for her Bachelor's Degree at Eckerd College. She is also a member of Eckerd's maritime search and rescue team. 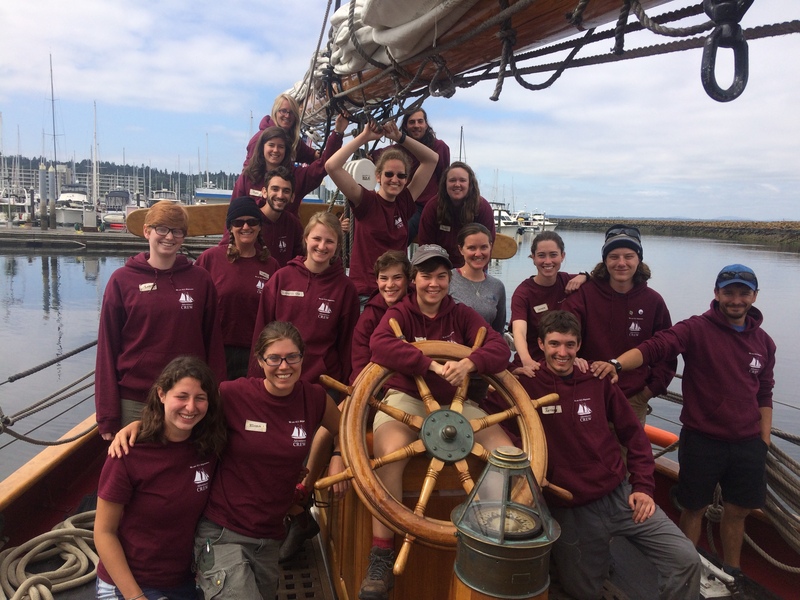 Her last job was as an intern doing environmental work for the Nature Conservancy in Genoa, Nevada, and she is excited to get a chance to work aboard the Adventuress. Fiona grew up in Olympia, Washington, where she just graduated high school this year. She will be attending Western Washington University next fall but is undecided on her major. She has been a participant aboard the good ship for several years and is excited to finally come back as a crew member.